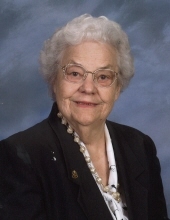 Naomi Mae Estvanko of Bremen passed away Sunday, November 10, 2018. She was born in Haralson County, February 26, 1926,daughter of the late John Alexander Bagwell and Bertie Mae Johnson Bagwell. Mrs. Estvanko was a Bus Driver for Haralson County Board of Education for twenty-four years and a Manager for Mill Industries Printing Company. She was a member of the First Baptist Church of Bremen. In addition to her parents, she was preceded in death by her husband, Frank Andrew Estvanko; two sons, Danny Andrew Estvanko, Ricky A. Estvanko and a daughter-in-law, Cynthia Estvanko. Survivors include her children, Dyan and Donald Robinson of Carrollton, Larry and Teresa Estvanko of Temple, Gary and Donnia Estvanko of Carrollton; grandchildren, Charlotte Barnett, Chris Estvanko, Brandon Estvanko, Andy Estvanko, Amy Miller, Stephanie Melson, Mandy Wells, Misty Shows and Matt Holcombe; twenty-seven great grandchildren and a brother, Michajah and JoAnn Bagwell of Tallapoosa. The family will receive friends at the funeral home Sunday from 6:00 to 8:00 PM. Services will be Monday, November 12 at 2:00 PM from the chapel of Hightower Funeral Home with Michajah Bagwell, Darlene Cleveland and Julianna Boggs officiating. Interment will follow in Forest Lawn Memorial Park with Brother Herman Parker officiating. The following gentlemen will serve as pallbearers, Chris Estvanko, Brandon Estvanko, Andy Estvanko, Shawn Melson, Darryl Miller, Brian Wells, Brent Shows and Joey Boggs. Grandchildren and great grandchildren will serve as honorary pallbearers. To plant a tree in memory of Naomi Mae Estvanko, please visit our Tribute Store. "Email Address" would like to share the life celebration of Naomi Mae Estvanko. Click on the "link" to go to share a favorite memory or leave a condolence message for the family.